Jimmy the Guinea could not be happier in his new home. Before we got him, he was a barn guinea who didn’t get to free range at all, and he had the scruffy caged look that goes along with that lifestyle. Now that he’s free to wander, his feathers have smoothed out and he looks much more content. I love watching him run over to investigate a patch of grass, then get distracted by a juicy bug, then make a beeline for Luigi. Jimmy doesn’t have a “slow” speed – it’s like he’s so excited to be free that he wants to cram as much experience as possible into every moment. He particularly loves treats, and since he’s the fastest bird we own, he is usually the first to come bounding up to me if he sees anything in my hands. He’s also very much in love with Luigi, and follows her all over the place, making sweet cooing and whistling noises. 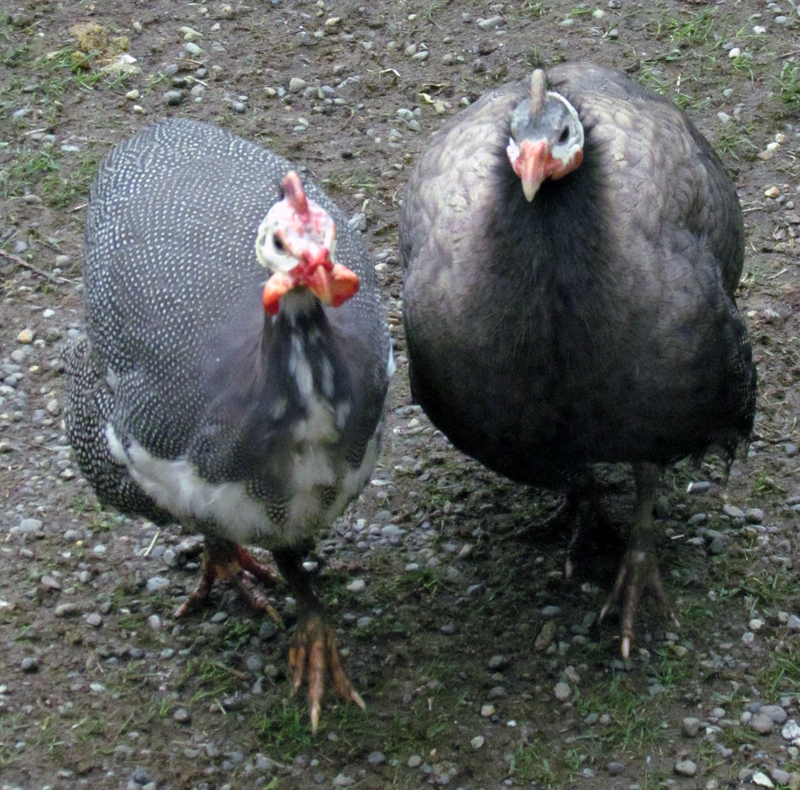 But Jimmy’s not the only lovesick fowl in the pasture – Dimsworth and Hawthorne are falling all over themselves trying to impress the ladies. It’s rare to see them in unpuffed form – they’re always showing off. 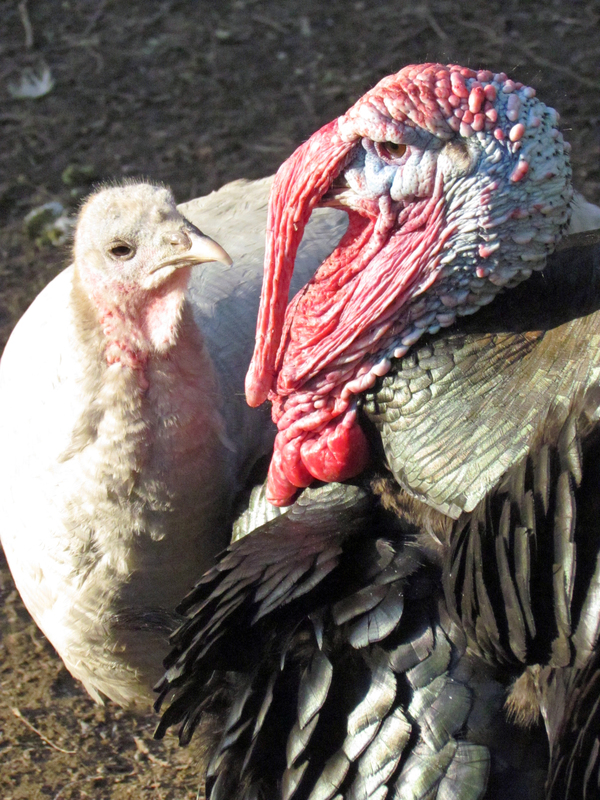 I found our first turkey egg yesterday, so it’s just a matter of time until one of them goes broody. I’m quite surprised one of the ducks hasn’t started a nest yet – by this time last year we already had a clutch of chirping ducklings waddling around the yard. I spent quite a bit of time in the front yard in the last few days, mostly because I needed a break from the non-stop avian adult movie action in the back yard. Gene and I got four new fruit trees with my recent lottery winnings (and some of my own money, too, $100 only goes so far at the greenhouse and I can’t stick to a budget to save my life), so the front is looking quite springy and festive. We had to pot the trees and put them in the driveway, because our last attempt at an orchard got devastated, Godzilla style, by Shy and the goats. I’m hoping that summer temperatures get here soon so I can move the fig, banana, and avocados trees outside as well. It’s a good thing we have a big driveway.